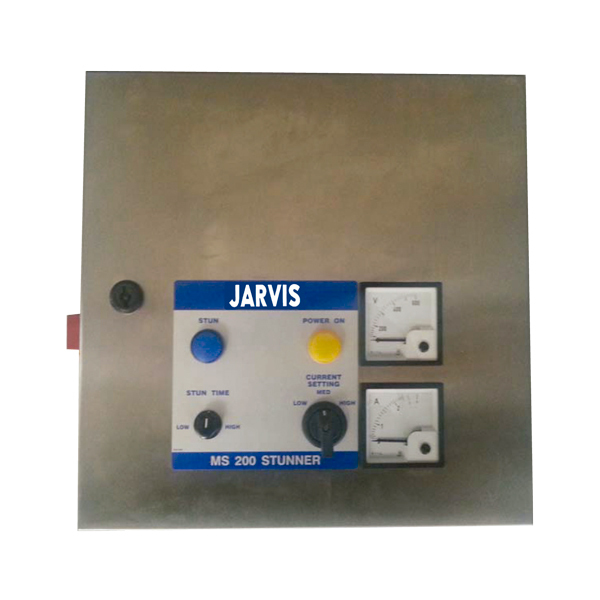 The Jarvis Model MS200 – electrically controlled stunner for stunning sheep, bobby calves, deer, pigs and poultry. • The Jarvis Model MS200 Stunner manufactured by our JETCO subsidiary, for both halal and full kill stunning. • Safe – stunning voltage isolated for operator safety, with two handed anti-tie down triggers. • Adjustable output current and stun times – three settings: 0.7 – 2.0 available amps.range. • Adjustable time – 1.6 second stun time. • Used with Jarvis stunners Models 1C, M1J and M2A.